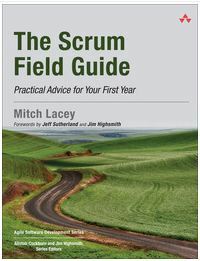 My Projects at Work podcast interview with Mitch Lacey, author of The Scrum Field Guide. Also, check out my review of the book here. One of the things that is difficult about taking a Certified Scrum Master or Certified Product Owner classes is that to a large extent, the material looks at Scrum in a state that is (for many) based on an ideal they may never reach. Once students leave the class and go back to work, the number of obstacles they face in the struggle towards Agile transformation can be a daunting thing to overcome. If they are brave enough to take up the challenge, they soon bang up against the fact that when they try to apply Scrum in the wild, what they end up facing may not sync up so well with what was taught in class. When we don’t know what our velocity is, what do we tell our stakeholders we can commit to? What if you have to play two roles at once? How do you deal with team members that are only needed for brief, very specific types of work? How is Scrum Master a full time job and how to you convince others of that? The cases are presented through stories that set up the different situations. Lacey then draws on his own experiences leading and coaching Agile teams to explore the different options and offer his recommendations. The book also includes a “First Aid” section for those who are trying to solve very specific issues with things like “Running a Productive Daily Standup Meeting” and dealing with some of the cultural challenges that are part of Agile Transformation. While it is called the Scrum Field Guide, the book is not just about Scrum. Lacey introduces his own practice of Agile by saying that for him, one of the keys to getting Scrum to work has been pairing it with Extreme Programming. Throughout the book, Lacey introduces XP practices where he has seen them effectively utilized with Scrum. While the book does include information on the actual Scrum Framework (in the Appendix) it is really designed to work best for folks who have a bit of experience in using Scrum and are seeing various issues, or “smells” as they are often called, creep up. There are a lot of books out there that are aimed at clarifying what the Scrum Framework is. If you have clarity on what Scrum is supposed to be, and need a resource to help you make it work, The Scrum Field Guide will be a great addition to your tool belt. The title of the book indicates that this book is intended for people who are in their first year of doing Scrum. I’ve been working with Scrum for many years now and I’m also a Certified Scrum Trainer. I still found a lot of valuable information in this book and expect it is something I’ll be referencing in the future when I’m coaching.